Aprilia Racing Team rider Eugene Laverty topped the timing sheets at Aragon in Q1, after finishing in 4th in FP1. Chaz Davies was close behind Laverty with Tom Sykes 0.83 behind, rounding out the top three. Marco Melandri finished the session in fourth position for BMW Motorrad GoldBet ahead of Jonathan Rea and Laverty’s teammate and Philip Island race 1 winner Sylvain Guintoli. Just 0.6 seconds covered the top six. The Fixi Cresent Suzuki’s Leon Camier was 7th, recorded on his third flying lap. The Brit fell heavily on his fourth lap, causing the session to be red flagged, he’s been taken to hospital and is unlikely to ride this weekend. 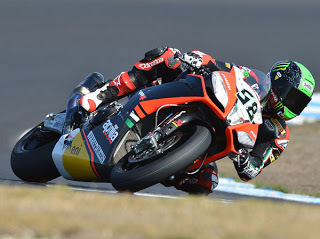 Camier’s team mate, Jules Cluzel was 8th, ahead of Frenchman Loris Baz and Italain Davide Giugliano rounded out the top ten, 1.051 seconds off Laverty. British rider Leon Haslam finished the session in 11th, ahead of former world champion Carlos Checa. The second qualifying session is tomorrow morning, followed by a final free practice and then Superpole.